spiritual bankruptcy of the Italian people. Italy is rich in religious tradition, but is largely lacking faith that saves. Posters are commonly used to communicate a theme or concept, so I decided to design one and this is what God inspired me to create. 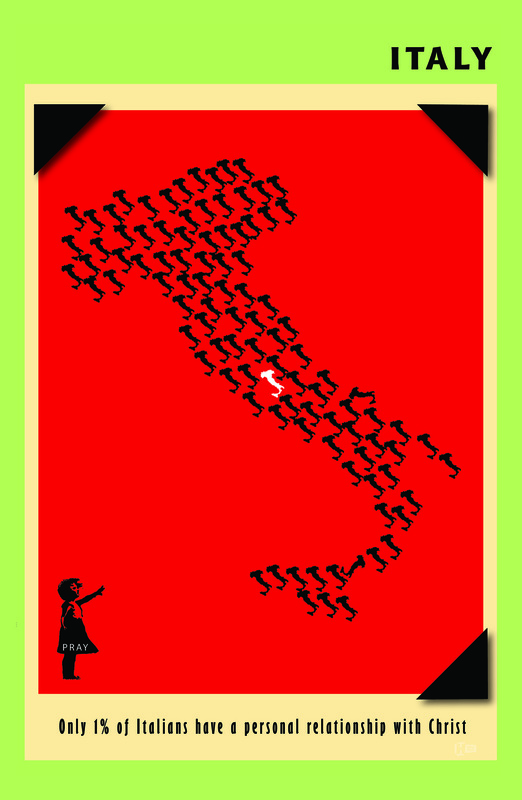 At first glance you can easily see the familiar “boot” figure that is the outline of the country of Italy, but if you look closer you’ll see that 100 little Italy’s make up the larger figure. It is a visual representation of the spiritual state of the nation. Each little black Italy represents a percentage of people in the country who do not have a personal relationship with Christ. As you can see, there is only 1 small Italy that is not black. It represents the lonely 1% of Italians who have a personal relationship with Christ. The small girl in the corner is reminding us to PRAY for the country with child-like faith: faith that God can revive Italy as a nation and bring it back to Himself, faith that each person in Italy can know the truth of salvation by grace through faith, and faith that believers can be motivated to go and share the gospel with others. Initially we used this poster as a backdrop when we met with groups of people or set up in churches to present our ministry. It was eye catching, thought provoking, and a good conversation piece. However, some of those who saw it said the poster would be a good reminder for them personally to pray for the people of Italy. So, I made a limited run of 25 of these posters, size 11×17, for anyone who is interested in owning one. I am only asking that anyone who would like one would cover the cost of printing and shipping the poster, which comes to $8.00 per poster. If you are interested in purchasing a poster just send an email to me at jon@hellotello.net including the address you want it sent to. It’s first come first served so email me and I’ll respond with details about where to send the check. I hope that this poster blesses you as much as it has blessed us. It hangs in our living room/office and God has used it to remind us why we are going to Italy. I hope it will be a reminder to you as well to be praying for the lost in Italy, and around the world. I hope I can make my artwork available for all of you. I will try to make a limited run through of my artwork at least once a year. Keep your eyes open for it! Click here to see a large picture of the poster!